Born plain Keith William Smith on the 17th October 1944, started life in showbiz with a String Puppet Act, but was to become Famous in the Circus World as The Amazing Etna - The Boy Wonder Yogi and also as Tizzy the Clown. This is the story of one man's amazing roller coaster life in show business. The ups and downs, the tears and the laughter, are all revealed within the pages of this down-to-earth look at the world of performing. The failed marriages, long distance separation from his children, along with successes and failures galore, make this a book that all would be wise to study before considering a career in Showbiz. In later years he also made his mark in Old Time Music Hall, Variety Theatres and Cabaret as a Stand up Comedian, along with his renowned Max Wall & Old Mother Riley Tribute acts. He has even toured Sideshows on the Fairgrounds, as well as working on other "parading" shows on the gaffs. Indeed, you name it and he has done it -- from Children's Birthday Parties, to topping the bill in Pantomime, to cabaret shows in the seediest of nightclubs and strip joints, through to corporate events and prestige venues like the Blackpool Tower Circus, Belle Vue Circus and Cirque d'Hiver (Bouglione - Paris), to name just a few. Of note is the fact that he was the only Specialty Act in the World -- with his Bed of Nails, Fire-Eating, Dancing on Broken Glass & Other Yogi Stunts -- to ever work three consecutive seasons at the World Famous Belle Vue Circus in Manchester whilst also Clowning as Tizzy in the show at the same time. During his career, he has worked with and alongside some of the biggest names in Circus, Variety and Comedy. He is proud that his son, Alex Smith (aka Jonathan Royle), who was born whilst he was touring with Gandey's Circus, made his stage debut aged 3 as Flap the Clown and continues to perform in various fields of the showbiz industry to this day. 1) Promotional Video for Adults & Kids Shows - 15 mins. 2) Max Wall Tribute Act - 21 Minutes. 3) Old Mother Riley Tribute Act - 20 Minutes. 4) Tizzy the Clown Kids Show Circa 1987 - 43 Minutes. 5) Tizzy the Clown Kids Show Circa 2000 - 38 Minutes. 6) Sword Box Illusion with his Son Alex - 13 Minutes. You will also find well over 750+ Jpeg Images of Press Cuttings, Show Posters, Leaflets and Photographs from his years in showbiz which themselves are pure gold in terms of those interested in old Circus, Variety and general showbiz memorabilia. "When I saw LES-LE-ROY perform, it was like looking in a mirror. This man is an outstanding performer." "It's a pleasure to work with someone of his outstanding comedy timing." "After seeing Tizzy perform, I immediately engaged him for the world - famous 12,000 seater 3 ring circus in Paris, where he was an outstanding success." "After seeing LES-LE-ROY?S Old Mother Riley routine, we immediately booked him to top the bill as "Queenie" in our pantomime, Sleeping Beauty." "Within 3 days of putting up the Circus Showtime posters, our theatre was sold out." "No one can capture the atmosphere of the circus better than Tizzy the Clown." This video is for online viewing once purchased. Please ensure that you can view the demo videos on this site before purchasing. 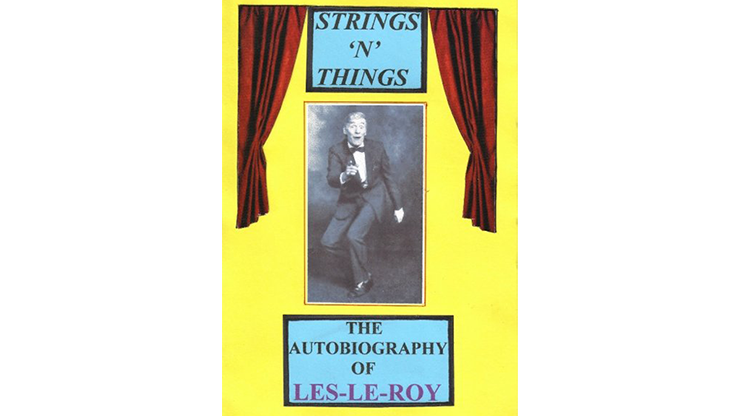 Strings 'N' Things - A Life in Show-Business by Les-Le-Roy aka T Born plain Keith William Smith on the 17th October 1944, started life in showbiz with a String Puppet Act, but was to become Famous in the Circus World as The Amazing Etna - The Boy Wonder Yogi and also as Tizzy the Clown.